Nimbin’s S.E.V.E.N. Sibley Street Sustainable Living Hub still has a way to go (raising funds to finalize purchase of the site) and permanent plans & building projects will really only be able to be developed after this. Meanwhile, the site remains as it is, an empty block with an old dilapidated house fenced off for public safety. Not much to look at for such an exiting project! So we put in a proposal to create some temporary installations to help generate some interest (and hopefully inspire more donations!). Nothing too permanent or too costly but something funky to inspire & obviously congruent with the theme of sustainability. As everybody is fascinated with domes we decided to hold a workshop to build the simplest version we know, which uses only 4 pieces of bamboo (split into sections of 5). This design is based on a 2V geodesic dome, developed by Professor Daisuke Takekawa of the University of Kitakyusha, but unlike geodesic domes requires minimal measuring, cutting & joining. His design uses continuous pieces of split bamboo (easy to bend) instead of complicated triangles & joiners. 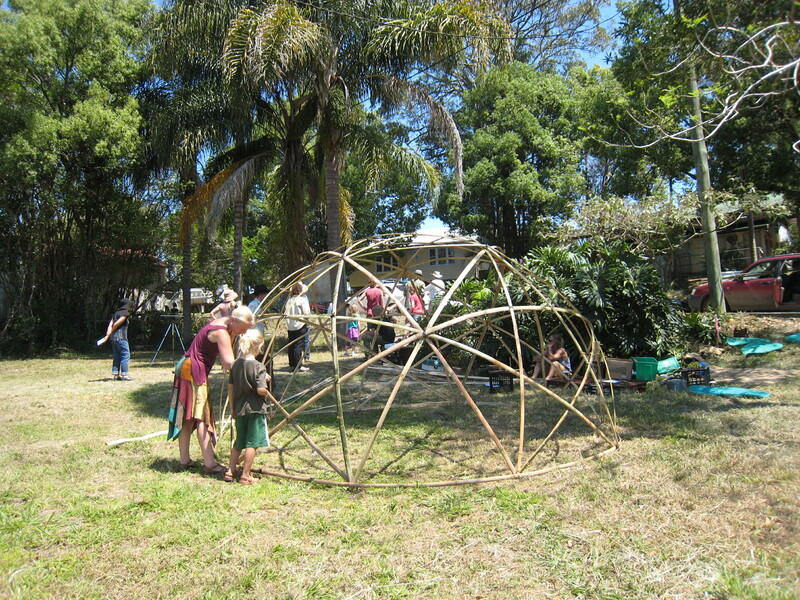 And so, on the 7th October 2012, 16 enthusiastic local participants came together to learn the process & now, a new Star(dome) is born on the streets of Nimbin. 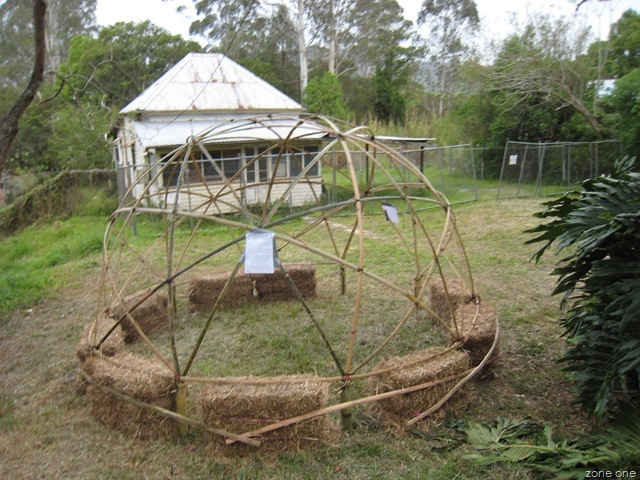 This is the finished dome at the end of the day, mounted on short bamboo posts in-filled with straw bales donated by the Blue Knob Farmer’s Market (left over from the bale house we made for the Nimbin A&I Show. We used 15 splits (+ 2 for the base) 6.5m long to create a dome 4m in diameter, prepared the splits by sanding (bamboo splinters are nasty) & treating with Cooee Timbertreat, a non-toxic, BFA certified, lanolin based exterior timber treatment from Painted Earth. The aim of this installation is to promote sustainable living & we consider growing your own food in urban spaces an important part of future food security, good health & reducing food miles & that every space offers the potential for planting. So next we will make raised gardens with the bales, first watering in seaweed solution (to reduce mould & release nutrients for the plants), then parting the ‘bricks’, filling with compost and finally planting with edible climbers (beans, tomatoes & yams). Straw bale gardens are instant landscaping & no-dig! The structure itself demonstrates the sustainable principles of using renewable resources (bamboo & straw), design efficiency & conservative use of material (maximum space: minimum material) as well as multiple functionality (both shade/shelter & growing support). These domes can also be used as greenhouses, chook tractors with chicken wire cover or light weight temporary shelters (shadecloth or tarp covers). We plan to make fitted waterproof covers next. This entry was posted in projects by zoneonesustainableliving. Bookmark the permalink.